Yesterday we reviewed the extreme euphoric sentiment levels in the U.S. stock market along with the incredible amount of leverage being used to propel stocks higher in Stock Optimism Now Bet With Maximum Leverage: Gold Sees Mirror Image. Today we will briefly review the prices being paid for these stocks in relation to their earnings, as investors bet on not being the last one out when the building catches on fire. Vitaliy Katsenelson wrote a book a few years back called The Little Book Of Sideways Markets. The book was focused on showing how markets move through long periods of secular bull and bear markets, usually lasting between 15 to 20 years. During the bull market periods the market moves up with cyclical corrections down along the way. During bear market periods the market moves sideways, with cyclical corrections up along the way. The following provides an excellent visual of this trend showing the bull market rise from 1949 to 1966, followed by the secular bear market sideways movement from 1966 to 1982, followed by the secular bull market rise from 1982 to 2000, followed by the secular bear market sideways movement from 2000 to present. What is even more interesting is that these secular moves tend to occur in intervals of exactly 17.6 years, providing us a guide point for the range of time when this current secular bear market will end. During the peak of secular bull markets (2000) stocks get overvalued because investors bid up what they pay for earnings, which can be tracked using P/E ratios. A bear market is the cleansing process of working out those overvaluations and extreme sentiment levels bringing P/E ratios back down to a single digit range (1982). At a bear market bottom when a new secular bull market is ready to begin, no one wants to own stocks, allowing price to earnings ratios to fall to extreme lows. The following shows where we stand in this process. The P/E ratio today is currently where secular bull markets have ended in the past (extreme overvaluation). The euphoria in the market is incredible when compared to the underlying fundamentals of the earnings behind the stocks. 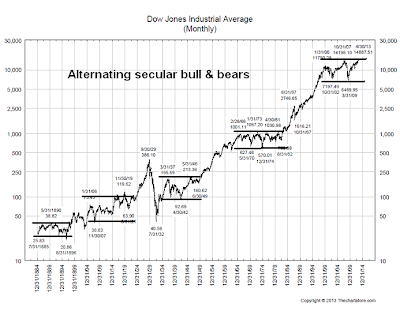 Based on history, we are now at a point of maximum danger as we move closer to entering the next cyclical leg down in the current secular bear market. Vitaliy wrote an article this week discussing where we are in this process. One of the things I found fascinating was that he wrote articles and gave speeches back in 2007, during the peak of the last counter trend rally, and he said he could now use many of the same materials he used back then because the same process of overvaluation and higher sentiment levels have returned like an echo. A chart from his discussion seen below was regarding share buybacks. One of the most "bullish" comments you hear from the mainstream financial world is that companies are buying back their stocks which will push prices even higher. History shows that companies buy stocks heavily at market peaks and stay out of the market at bottoms. In the third quarter of 2007 (the last peak) companies bought back a record $172 billion. In the first quarter of 2009 (the bottom) companies purchased $31 billion in their own shares; 80% less. The next historical visual shows earnings vs. GDP dating back to 1950. You can see that earnings always revert back to the true growth of the country they are found in. This is important if you believe the global economy, or the country you own shares in, may be slowing as we move forward. If you have heard recently that ownership of stocks is important because "there is not other option for yield," (a topic I discussed in detail in Why Buy Stocks? There Is No Other Alternative For Income), then the following chart should provide some concern. 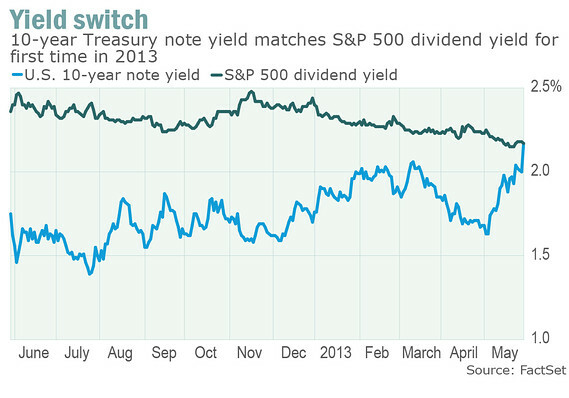 The 10 year treasury bond has risen to 2.13% which is now higher than the S&P 500's dividend yield. How much higher can stock prices goes in comparison to their underlying fundamentals? Much higher. 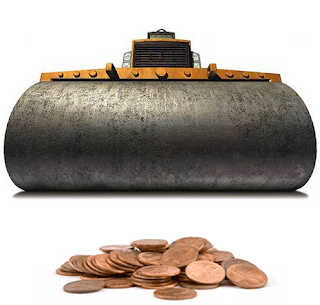 In our financial markets today, due to the liquidity and leverage, we move through a process of rolling bubbles. My only concern with playing with the fire in the market is that in today's high frequency trading world a large scale market crash can now occur in a matter of minutes. If you get up to go to the bathroom, a large part of your portfolio may not be there when you return. Buying stocks today can be described as picking up pennies in front of a steam roller. Proceed with caution.